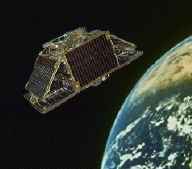 The Swedish scientific microsatellite Astrid-2 was launched on 10 december 1998 at 11:57:07 UTC into a polar orbit at about 1,000 km altitude from Plesetesk in Russia. Astrid-2 was carried piggyback into orbit by a Kosmos-3M rocket, and stayed operational until July 24, 1999, gathering about 26 gigabyte of valuable scientific data during its more than 3,000 orbits around the Earth. A remarkable performance of this little craft! The microsatellite looks like and weighs about as much as a typical view graph projector. The sides are 30 - 40 cm, exclusive the solar panels. The weight is some 30 kg. The satellite platform is developed and built by SSC Science Systems Division, Stockholm. PIA - photometer experiment from MPAe, Lindau, and IRF-K, Kiruna. There were two dedicated ground stations serving Astrid-2, one for each hemisphere. The northern station run by SSC, Stockholm, which besides receiving data also operated the satellite by uplinking satellite commands. Received data was relayed by KTH to the other payload groups via Internet. The southern station is SANAE IV in Antarctica. The station downlinked data which was sent to the payload groups via Shipnet.